LEBANON, Tenn., Friday, July 18, 2003 – IRL Infiniti Pro Series points leader Mark Taylor won the Cleanevent 100 at Nashville Superspeedway after leading all 77 laps, but the victory was anything but easy. Pole sitter Taylor held off repeated late charges by Tom Wood, edging fellow rookie Wood by .3361 of a second for his fourth victory in six starts this season in the No. 4 Fulmar Panther Dallara. Taylor tied an Infiniti Pro Series record for career victories and most victories in a season with four. A.J. Foyt IV also won four races in the inaugural season last year en route to the season title. It was the second time in the season that Taylor won from the pole, as he also led every lap from the top spot at Phoenix. Ross Fonferko finished third in his first career Infiniti Pro Series start in the No. 6 JR & Associates/Sam Schmidt Motorsports entry, just .7723 of a second behind Taylor. Taylor averaged 142.306 mph for his second consecutive victory. He extended his series lead to 96 points over Ed Carpenter and Thiago Medeiros, tied for second in the standings. Medeiros finished fifth in the No. 36 Genoa Racing Dallara/Infiniti/Firestone. Carpenter finished 13th after being eliminated from the race on Lap 22 when his No. 14 Futaba/Delphi/A.J. Foyt Racing entry brushed the wall exiting Turn 4. Taylor’s lead in the second half of the race rarely exceed one-half second as Wood and Brandon Erwin pursued. Sam Schmidt Motorsports teammates Wood and Erwin dueled wheel to wheel repeatedly for second on the 1.33-mile concrete oval yet never let Taylor escape. Wood was second, and closed inside of two-tenths of a second of Taylor, on Lap 71 when Erwin spun into the infield grass near the start-finish line while running third in the No. 99 Natural Golf/Sam Schmidt Motorsports Dallara/Infiniti/Firestone. The spin triggered the last of two caution periods during the race. On the restart on Lap 74, Taylor pulled away slightly. But Wood returned within range of Taylor’s rear wing as the drivers entered the final lap. “He had several good runs on me,” Taylor said. “It was tough to keep him back. I felt I was fair. Wood then looked high and low in Turns 1 and 2 with no success, and Taylor then inched away on the back straightaway and in Turns 3 and 4 for the victory. Wood still earned a career-best finish. “We had a lot of car for him,” Wood said of Taylor. “He made his car pretty wide at the end, which is OK. That’s racing. I think we had a quicker car. “If we could have got by him, I think we would have cleared. We were fastest just about every session today. “Actually, the second to the last lap, I had a real good run on him going down into (Turn) 2. I was waiting for him to pick which way he was going. My teammate (Erwin) and I found out we could run the high line through there. Wood said that late-race advice from team owner Sam Schmidt helped him in his late-race duels with Erwin and Taylor. 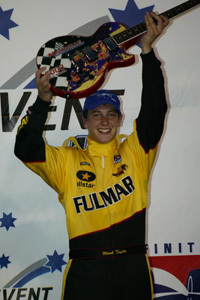 Schmidt was paralyzed in an IndyCar Series testing accident in January 2000. “Sam is a great guy,” Wood said. “Sam was on the radio to me at the end there. I know he can’t drive now, but he was there with me the whole time.